email: carolsparkles@gmail.com with details of your event, or call 020 8658 0685. When you make a booking, details are sent to you by e-mail with all the agreed information. A non-refundable deposit required on some occasions for each painter booked and that will secure the date. The balance is paid on the day at the event. All dates are on a first come first served basis. Dates are not held without an e-mail confirmation of a booking from you. For late bookings, a booking form and agreement can not be exchanged. The method of payment is cash on the day. Invoices will be supplied on request. What do you charge to face paint? Its is always best to complete our quote form or email for an accurate quote. Quotes depend on travel, location, time of day weekend or weekday and number of people or children to be painted. There are special rates for local after-school parties during term time and morning bookings at weekends. 3rd year in a row and wouldn’t use anyone else. 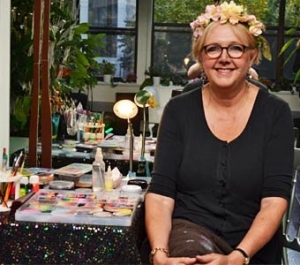 Learn the tricks of the trade with the ‘Introduction to face painting’ class, tutored by Carol Sloane or Saskia Donkers. The classes are run during the week in school hours. You have the options to participate in small groups, with a maximum of 4 attendees. You and a friend is the best, or your own individual full on class. At the introduction to face painting class, all products are supplied. The fee for a class with up to 4 people attending is £75 each, or £150 for a 1-1 Class of 4 hours. The classes are kept small so we can cover a lot of ground with information and practice. Classes take place at a venue in Bromley. If you prefer the class at your venue and then there will be a travel fee. For classes for more than 4 people, an extra tutor will be supplied. For information about fees for more than 4 people, please contact Carol with details for an accurate quote (invoices supplied). When you want to brush up on your skills, Carol or Saskia also run 1-1 session or group follow up sessions, and you let her know what you want to cover in the session. There is another option that might be of interest for more experienced painters. You can decide what you want to cover in the class. This class is only suitable if you already have a working knowledge of the introduction to face painting class content (see below this message for detail of that class). I focus on the painting techniques you want to develop. My fee if you come to me at my venue is £50 an hour- it may be more if I travel to you. It’s a good idea if you want to do this class if you send me some photos of your work and kit. We do not use children’s names in photograph captions necessary compliance to the new data protection laws coming into force on 28th May 2018. If I have your photo or child’s photo on my website or facebook and you would like it removed please contact me ASAP”. Asking for you to sign a written consent form when we ask to take a photo of your child or you. Under the Child Protection Act, we will only ever use photographs with the permission of parents and the images will be used for agreed use such as Social media and marketing purpose of our related business(s) In this case Face Painting. We do not allow photography/photographers unsupervised access to children, and an adult will need to be present at All times and in agreement. We not approve of photography sessions outside the event or at a child’s home unsupervised. If at any time, you would like to withdraw consent with any images you have allowed us to use, then please let us know in writing/email and we will take any images down within 7 days of your request from social media. With regards to any marketing material we will let you know the time frame in which this can be done to ensure all parties are happy. Can you supply me with more than one face painter? 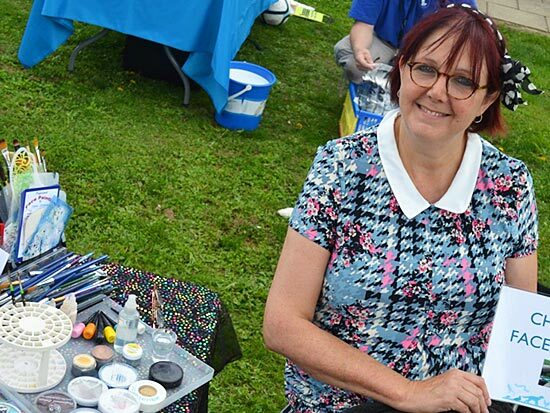 Carol paints with a group of freelance face painters who have worked together passing bookings to each other for around 12 years. We are insured and most have CRB checks or police checks. The Face Painters live around London areas. We have all worked at many corporate events, private parties and have been booked for 2 international bookings in Kuwait. If Carol is not available for your party or event, she will aim to source face painters within the group who work to an agreed ethical standard. If you should decide to book a painter, Carol will forward the painter’s details to you. Sparkles Face Painting is not an agency, we are a co-operative. The agreement of booking and your terms and conditions of service is between you and the face painter you book. Payment should be made by a bank transfer to the account listed on the invoice, any day before the day of the booking, or cash on our arrival. We will confirm when payment reaches our Bank account. You will be sent an email to confirm our receipt of the fee. Although we do our utmost to replace any painters unable to attend. The pro-rata funds will be given back to you, instantly this is apparent and you will be informed of the changes. Payment can be made in alternative ways if this does not suit you. Sparkles have two chosen charities supported by face painting at their events. At this present time, no new charities can be accommodated for free face painting services. For events that require something a bit edgier, or for ‘adults, over 18’s’ entertainment, Carol provides intuitional tarot card readings at consultant level; (Qualified with the British Astrological and Psychic Society) delivering tarot card readings in an assured confident manner. She gives time and attention and in depth readings to her one-to-one clients as well as light hearted, mobile table top readings at corporate events for your guest’s entertainment. Carol has been told her style is unconventional and upbeat; especially fun and entertaining at corporate events and parties. As a team, we face paint at many school events, but our fee and the quantity of faces we paint an hour is 10-15 will not normally cover your costs, if you are hiring us to fundraise. I run Introduction to face painting classes, that many schools have found useful, for parents who want to develop the skills to face paint quickly and effectively. This class can work out more cost effective for school fundraising than booking one of the team I work with. Models include butterflies, wands, animals, hats etc. Please discuss at time of booking your requirements for an accurate quote. If you are booking a two-hour party with less than 12 children, we can include balloon modelling in the price. What sort of face painting can I expect at my party? As with any artist, we all have our own style, so when booking a face painter it’s important to book the face painter that can give you the designs and style that suits your event as well as the fee within your budget. All the face painting you see on this web site have been painted by Carol Sloane, at parties and events (not for a studio photo shoot). If you book Carol for your event you can expect the same standard of face painting and the designs you see on this website. She face paints 10-12 faces an hour but can go to 15 with less detail. Do face paints stain skin or clothes? The paints we use are approved for children’s skin by the EEC. They are best quality cosmetic grade face paint. Most face paint used on children’s skin are water based so will wipe off with a wet wipe, or if on clothes in a washing machine. Some paints, in particular, the blues, green and red matte colours can leave a tint of colour on the skin. If a child has dry skin, the face paint may stain a little. The hint of colour will disappear after a day or if soap and a warm flannel is used. All face paint should be washed off before going to bed. What are your health and safety standards? Carol has strict health and safety guidelines that all freelance face painters working with Carol paint too. We use a fresh sponge for each child and the kit is fully cleaned after each event. The products used are approved for children’s skin by the EEC. Children with sensitive skin can have a patch test if requested. How many faces do you paint an hour? We paint 10-12 children’s faces an hour. The designs Carol paints are on the list below, they are the classic face paintings that work well on the human face and can be painted relatively quickly to accommodate 10-12 faces an hour. Other requested designs can be painted but don’t always work well on the human face or can take longer. When enquiring about a booking it’s always best to ask about a design outside of the menu and the possibility of it being painted. 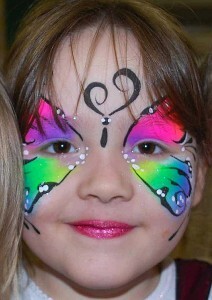 The most popular Children’s designs on the Sparkles face painting menu are following. Some of the Christmas designs are a snowman, Father Christmas, Rudolph, Snow flakes, snow/ Christmas flower garland, Christmas tree, Holly and berries, Ice princess and polar bear. The ladies/ mums/ hens/ prom glamour, love the glitters, sparkles and gems face and body art designs. Carol’s favourite painting is botanical art. A Medium size painting can take from half an hour to one hour depending on the painting you require. All the paint is easily washed off with soap and water. These paintings are great for photo shoots and something different for a night out, that will give you the wow factor. Do you face paint young children? We are happy to face paint children over the age of three. Children under the age of three often find the brush movements a bit tickly and don’t always understand what is happening. We will do small designs on children under the age of three as long as they are happy with what we are doing. We will not paint children who do not want to be painted. What are your copyright standards? All the face painting you see on sparklesfacepainting.co.uk has been painted by Carol Sloane, are owned and under copyright to her. Do not take copies of pictures and use them to gain custom or for business purposes. Ribena Black current farm event .